We have so many holiday charms and regular charms, you won't have any trouble deciding what to pick! My personal favorite Valentine's Day holiday charms are the Cupid's Arrow, Love word, Pink Crystal heart and Creamrose Pearls. Elegant yet fun! forget to add the Present Droplet to your chain! red, white and blue crystals. Perfect for any patriotic holiday. You can also make variations to add special forces such as the Navy, the Army, etc. Perfect for recognizing all of our many men and woman in service. South Hill Designs already had a great way to celebrate Halloween with our Black Cat Charm, Chocolate Bar Charm, Skull and Crossbones Charm, Crescent Moon Charm, Star Charm and Orange and Black Crystals. But we are now proud to announce three great new charms!!! 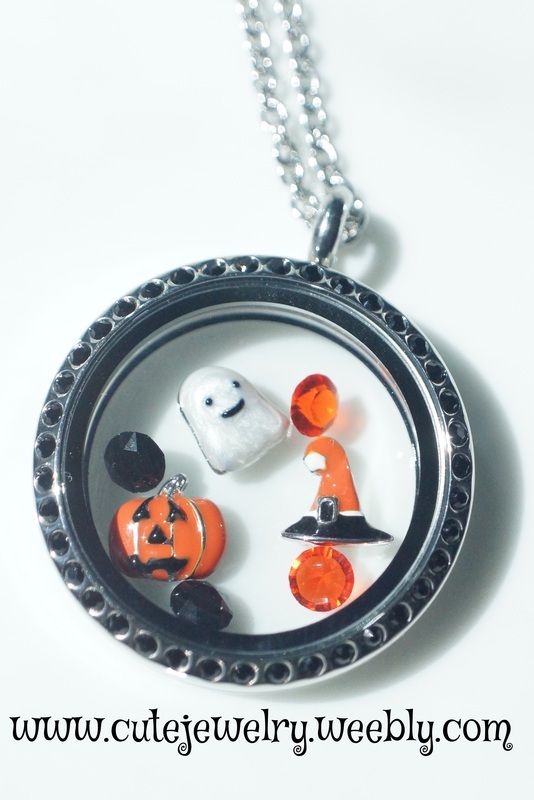 We are bringing you a Jack-O-Lantern Charm, Witch's Hat Charm, and Ghost Charm! 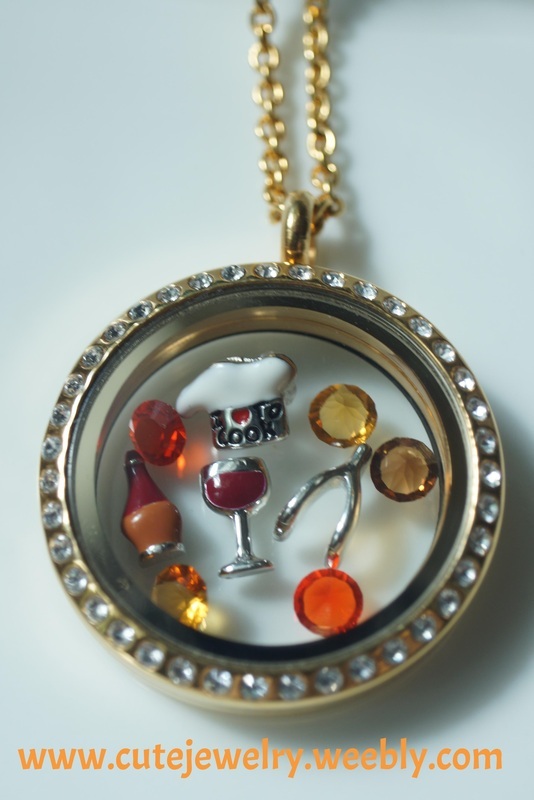 How cute are these lockets with a mix and match of everything? 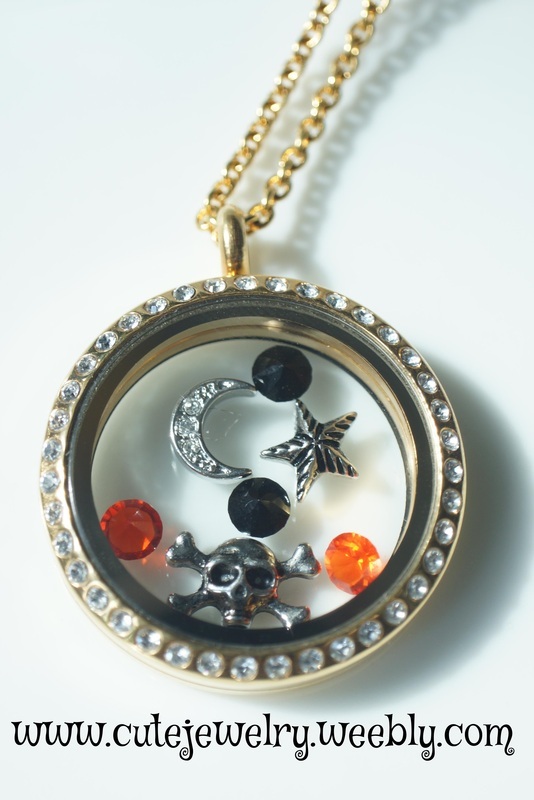 And they all fit perfectly in the Large Locket with Midnight Swarovski Crystals. 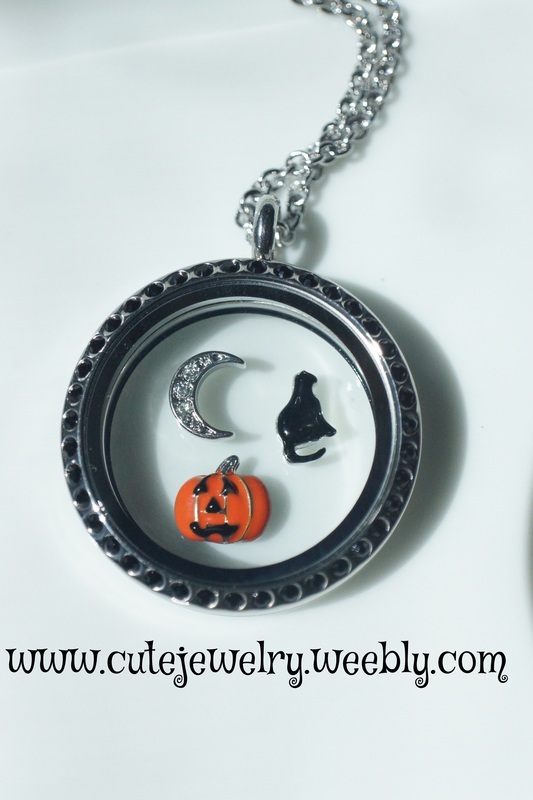 I can't wait to wear my Halloween Locket with Halloween Charms! Also check out the Pirate themed locket I wear often. Large Rose Gold Locket, Nautical Wheel Screen in Rose Gold, and Skull and Crossbones. St. Patrick's Day is another easy set of holiday charms. I like the use the Irish Hat, Claddagh Ring, Green Clover, and Irish flag. Depending on the locket size I use, I can throw in some green crystals to really show off my Irish spirit! religiously, add one of our many cross designs to the locket. You can't go wrong! What better way to honor your wedding day than by wearing your South Hill Designs glass locket and charms that represent that special day! We have an Engagement Ring Charm that will be perfect! Pair that with the letters "I said yes" or "I do" and everyone will know. You could even add a couple crystals or pearls that represent your wedding colors. Birthdays are a great holiday! It celebrates another year, a year of joy, trials, travels, and hopefully relaxation! Depending on the age of your birthday guy or gal, we have the best holiday charms to celebrate a birthday! number "1" and number "6." For a youngster's birthday, use the cupcake, their favorite animal, favorite color, birthstone, and the number charms that depict the year they are turning. birthday who is far away or passed away. I use the Grandma Heart Charm, Vintage Rose Charm, Sparrow Charm, and number "7" in my locket to honor my grandmother who passed away a year and a half ago. 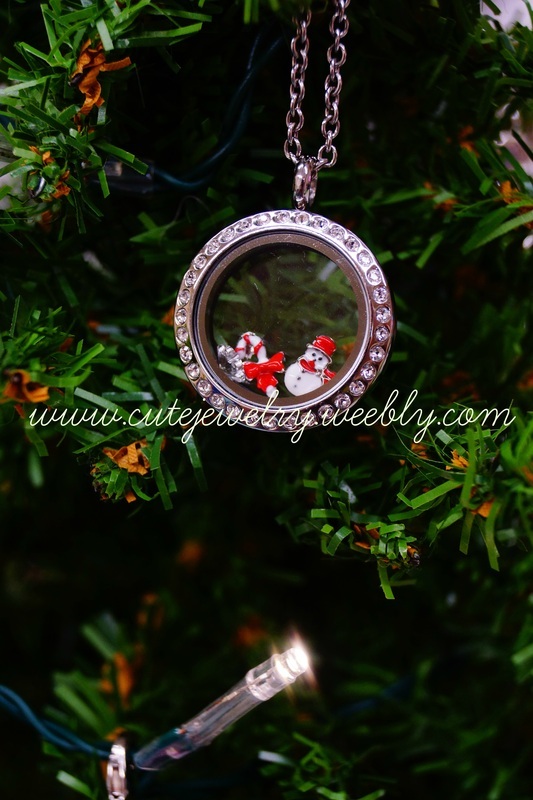 These charm necklaces are all about you and how you want to use your holiday charms. and the colored crystals of the Hanukkah candles. Or just simply blue crystals. is the perfect look for me. family loves to cook incredible Thanksgiving meals! 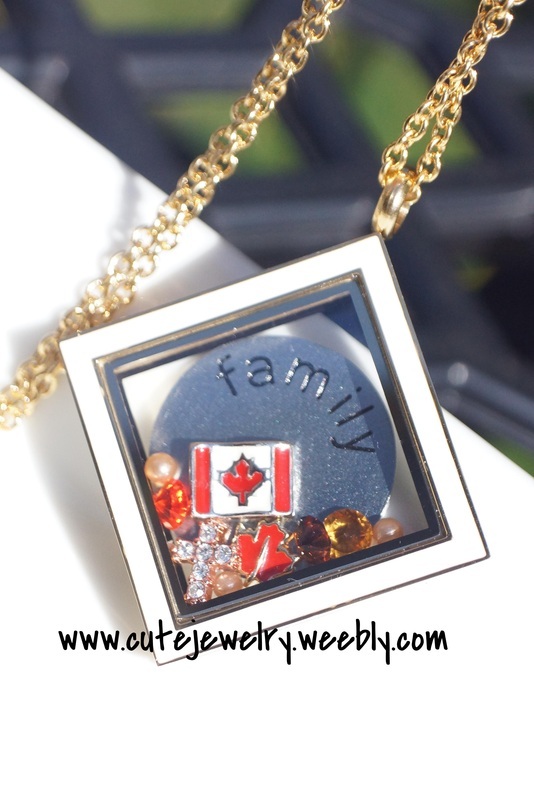 This locket is perfect for celebrating Thanksgiving, if you are in Canada for from Canada! This includes several Autumn colored Swarovski Crystals, the Vintage Gold Pearls, the Maple Leaf Floating Charm, Canadian Flag Floating Charm, and Rose Gold Crystal Cross Charm. We have also added the "Family" Coin. 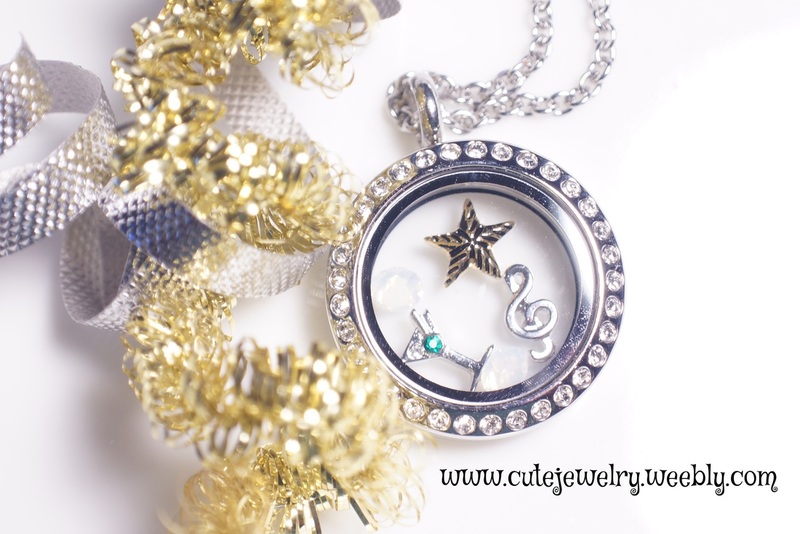 This is all set in our NEW Gold Diamond Floating Locket with White Accent. So pretty! 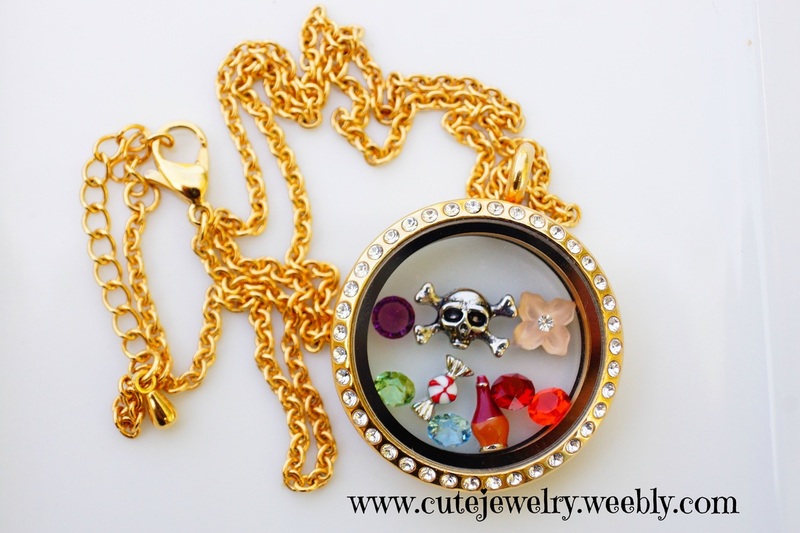 This Large Gold with Swarovski Crystals Locket has our Skull and Crossbones Charm, Candy Charm, Wine Bottle Charm, Flower Charm, and assorted colors of Swarovski Crystals.